Finale Ligure is not any normal kind of trail centre. These trails are built and maintained, but not groomed. The terrain is as diverse as passengers on the London underground, the sheer scope and crossword puzzle like nature to the way the riding areas present themselves blows your mind the first, second and third time you visit. Bike Park Wales is a lot of fun, but this ain't Kansas anymore Dorothy. Simply put, it's an adventure like no other. Split into around 8 riding zones around the beautiful town of Finale Ligure, the trails range from the flowing single track interspersed with rock and natural banks around the Melongo, to flat out fast descents littered with technical rock and natural features such as compressions and banked turns found around Crestino and Madonna della Guardia. You'll also see tight, technical switch backs and rocky chutes around San Bernadino and Feglino just behind the town itself. The varied nature of the terrain makes Finale Ligure the true test for a do it all bike. A DH bike might be great around the Nato Base and the impossibly rocky mens DH in Varigotti (trust us the iconic Enduro World Series photos of this stage do not do it justice! ), but are too much for the tracks around the town, or some of the longer flow single tracks around Stragroppo. Vice versa a cross country bike will find it's rider hanging on for dear life with some of the intense speeds and technicality of trails like Cavatappi (Where the much lauded, cancelled stage 2 of the Enduro World Series 2015 lies). Yes, this is true modern enduro bike territory, where that name actually means something. The fatigue on your bike and body here is less obvious than it would be lapping Pleney Mainline in Morzine. Here the sheer length of the descents and the way they gradually wear you down into a sloppy pile of smiling, sweaty gelato creeps up on you. There are some things you can do to help yourself however. You may pedal up to afew of the tracks around the village, but essentially Finale Ligure is gravity fed with MTB Beds, using Ride on Noli's shuttle service. Don't worry about the extra weight. DH tyres, 2.35 – 2.4 at least, with thicker casings does 3 things. First, grip. Second, when you are on your last reserves and you hit a section faster than you may like, you'll be thankful for that extra cushioning! 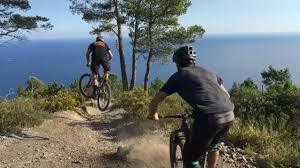 Third, and maybe the most important, Finale Ligure is superb at offering up punctures. Uplift or not, these trails are long enough you won't want to walk to the bottom, and your friends will get bored of waiting for you to fix endless flat tyres! To be honest, this is purely because pinch flats can happen every 30 seconds with tubes, take one in the pack just in case, but tubeless is the way to go here, you can run lower pressures, easing the arm pump and hand ache. A Peaty's tubeless setup is absolutely the way to go, we can even do it for you in house! If you have flat pedals, invest in a set of Five Ten's. Your poor foot folding around a pedal for 20 minutes in those old Vans is going to hurt by day 3! If your flat pedals are a little small, maybe think about a set of DMR Vaults or similar, widen that platform to alleviate the pressure. Make sure you are 100% happy with your grips, you'll be holding on tight, it'll be hot, your hands will be sweaty, which is another reason to wear gloves, no matter how cool the kids look not wearing them, you'll maintain grip on the bars and you'll be very glad for them should you put a hand down! Learn what those dials do on your very expensive bike. We have written a guide for this based on Morzine and many of these notes can be transferred to Finale Ligure. Braking bumps are not really a thing here, sure the odd trail will have them, but the thing that will get you are long sections of naturally rough trail, rocks, roots, dirt. Setup with a little less air pressure and dial your compression on, increase in air pressure as the week goes on. Let those dials do the work and soften up the start of the travel. If you don't have air, soften off the compression a little, just add that little bit of small bump sensitivity. We have an in house mechanic who can look after all of that for you! Take everything you need to survive, sometimes it is pure survival in those hills! Take a snack, the food here is amazing, but it can be a while before you get to it and you need the energy! Take water, there aren't many water stops around. Take the tools and spares you need to repair your bike! It's as much as an hours drive back to town from some rising spots here, that bike shop is a long way off! A good multi-tool, with chain removal and spoke key, a mini pump, tyre levers and tube, a split link for the chain, gear cable, some form of wrench to straighten and hammer bent parts, spare brake pads, duct tape and zip ties are a minimum! 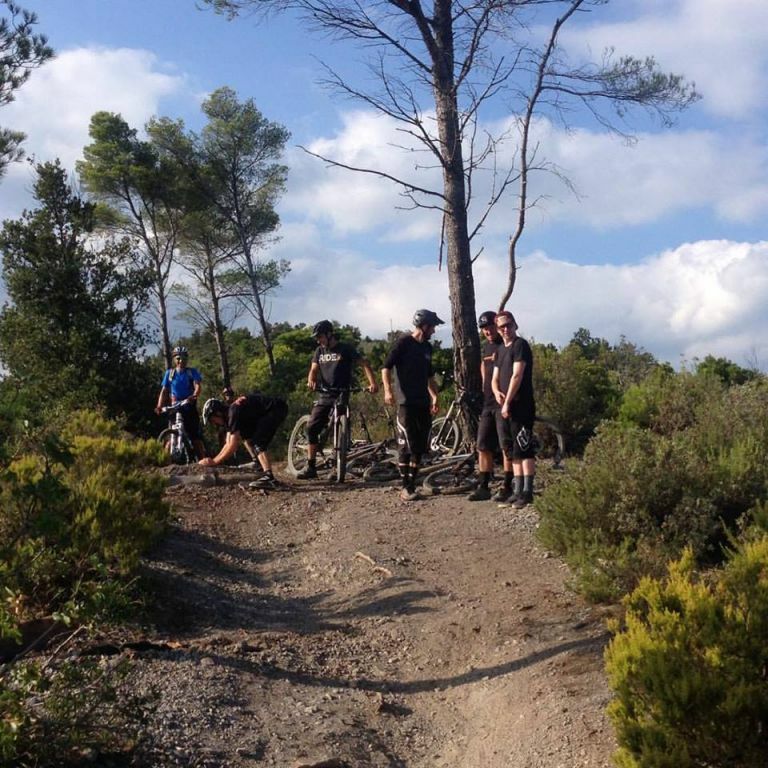 Tubeless setup and DH tyres are highly recommended for Finale Ligure! - 1 2 hour walk down to the bottom of the trail after we ran out of tubes and slashed a tyre on a rock. - 5, yes 5!!! 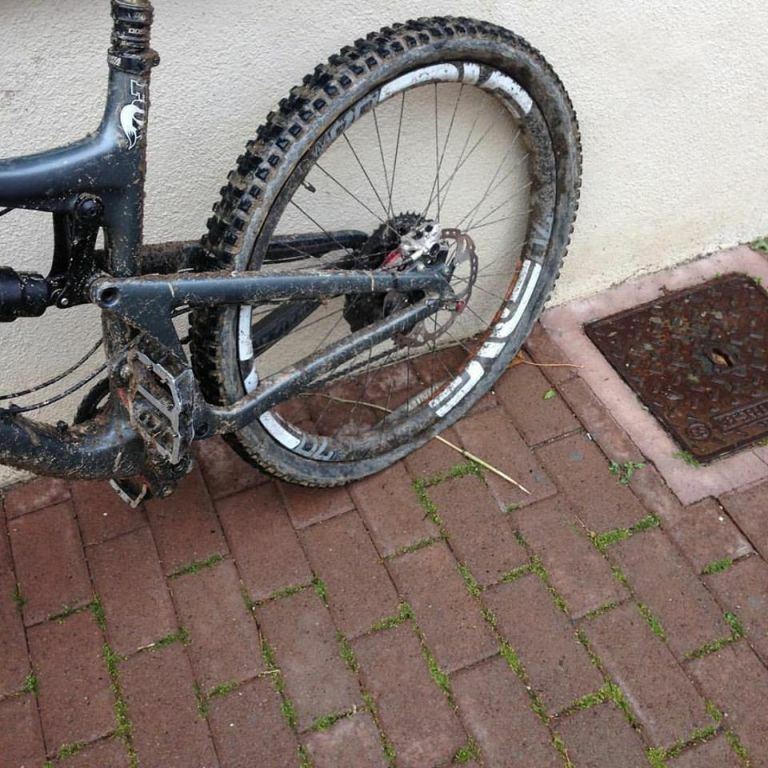 Punctures on one trail on one bike for one rider who had an XC rear tyre. - 2 warped brake rotors from running worn pads. - A dropper post stuck in full XC mode after a cable snapped at the top of the hill. - A chainless day out for one of us after a bent derailleur decided to venture into the spokes. - A long, tense day for that one rider who rode the remainder of that day with loose spokes and 4 missing from his rear wheel. - Several low blood sugar temper tantrums.